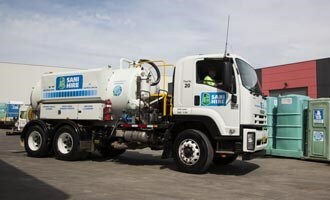 Waste management company Sani Hire has added an Isuzu FVY 1400 to its fleet. SANI HIRE'S PORT-A-LOOS FLUSHED BY ISUZU. Waste management company Sani Hire has added an Isuzu FVY 1400 to its fleet of 14 service vehicles operating across three branches in Victoria and New South Wales. The truck will be employed as a vacuum tanker for servicing portable toilets and liquid waste on-site with a capacity of up to 12,000 litres. The waste is picked up on-site and then delivered to Sani Hire's depots, which have government-approved trade waste facilities for the disposal of the non-hazardous contents into the sewage system. Apart from the FVY 1400 vacuum tanker, Sani Hire's Isuzu fleet also includes models such as the NQR 400, FSR 850, FVR 950 and FVD 950. Ranging up to six metres in length, the trucks are fitted with either a tray body or vacuum tank. All truck bodies are designed and built by vacuum tanker manufacturer Mansfield Vacuum Truck Supplies in Victoria. The vacuum tankers are fitted with either Canadian Wallenstein or Masport vacuum pumps, which enable the driver to quickly load the tanker without any messy spillage. The tanks are fabricated from extra thick metal to deal with the corrosive waste. For more efficient handling, the tanker's hose reel is hydraulically rewound, eliminating the need for the driver to rewind the hose manually. Managing Director Jay Wilson says the trucks' vacuum tanks keep the smell at bay during transit. "The only time you really smell it is when you are sucking the waste from the portable toilets and pumping it back in the sewage system," he adds. Wilson says the performance of the Isuzu trucks has been highly regarded by his drivers, especially in the areas of comfort and driver fatigue management. The company has just completed converting its entire truck fleet to exclusively Isuzu. "We've been using Isuzu trucks for 24 years and they are very dependable and reliable, ensuring we can deliver our customer service guarantee. 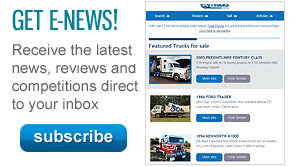 We usually keep our trucks for up to 10 years before replacing them with new ones," he says. "The FVY 1400's Isri 6860 air suspension driver's seat is a pleasure to drive on, especially on bumpy roads," he says, "while the power output (221kW at 2,400rpm) is ideal for extra heavy loads." Sani Hire provides portable toilets for everything from 21st birthdays and construction sites to a wide range of outdoor events. The company sets itself apart from its competitors by specialising only in all aspects of portable sanitation and dealing with portable toilets and associated products. It complements the provision of portable toilets by providing state-of-the-art waste removal, toilet cleaning, and the replenishment of fresh water, toilet paper and chemicals. According to Jay, payload capacity and reliability were two big deciding factors in purchasing Isuzu trucks. 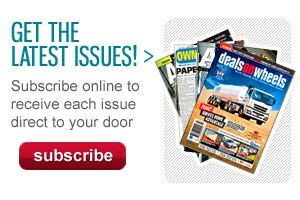 "We operate 24/7 and need trucks to keep up with the demand of our business," he says. "The Isuzus' automatic transmission and the short wheelbases we require are great for getting in and out of tight sites we have to service. "The resale value on Isuzus is really handy as well. The parts are very easy to source and we get great ongoing service for a low cost. "We are very satisfied with the quality of the product that Isuzu provides and we plan to add two more trucks to our fleet in the next 12 months." Founded in 1978 in Sydney, Sani Hire has since expanded into Melbourne. Its growth has been impressive and it now ranks as one of the largest independent suppliers of portable sanitation with a team of 22 employees.